Start with big oil companies, and the money and connections flow. Here’s how it fits together. Sallie Baliunas is a Harvard-Smithsonian Institution astrophysicist who has been providing scientific cover for global-warming deniers since the mid-nineties. She is a senior scientist at the George C. Marshall Institute (received $310,000 from ExxonMobil), where Marshall CEO William O’Keefe was a former ExxonMobil lobbyist, senior official of the American Petroleum Institute and chairman of the Global Climate Coalition. Baliunas co-wrote (with colleague Willie Soon) the Fraser Institute pamphlet Global warming: A guide to the science (receives $60,000 a year from ExxonMobil). Baliunas is “enviro-sci host” of TechCentralStation.com (received $95,000 from ExxonMobil) and is on science advisory boards for the Committee for a Constructive Tomorrow ($252,000) and the Annapolis Center for Science-Based Public Policy ($427,500). She has given speeches before the American Enterprise Institute ($960,000) and the Heritage Foundation ($340,000). The Heartland Institute ($312,000) publishes her op-ed pieces. She is not lying when she says she receives no direct funding from ExxonMobil, but the money surrounds her. Why might the oil giant be so taken with Baliunas? With colleague Willie Soon, she first claimed that solar effects could account for the earth’s warming. When that theory was discredited, they then wrote a paper that claims the twentieth century hasn’t been all that warm. This paper was published in an obscure journal, Climate Research, and partially funded by the American Petroleum Institute. It became a mini-bible for deniers. But the editor-in-chief and two other editors of Climate Research resigned, saying the paper should not have been published because of methodological errors in the research and a deficient peer-review process at the journal. After Kyoto’s ratification by Parliament in 2002, [Fraser Institute environmental director Laura] Jones became an “adjunct scholar” at the institute and then chief lobbyist for the Canadian Federation of Independent Business in British Columbia, where she carried on her anti-regulation work. Her position at the institute was filled by Kenneth Green, director of the environmental health and safety program at the Reason Institute, a Los Angeles-based libertarian think-tank that specializes in fighting environmental regulation, claiming it is an affront to liberty. Reason’s anti-global warming propaganda is based on the claim that “climate change has been a natural phenomena [sic] throughout the course of time.” Do man’s activities affect climate? “That is still open to debate,” Reason’s web site informs us in a reasonably sounding way. “Some would say none at all while others will say that it is dramatic “. Reason is funded by a number of conservative foundations, the American Petroleum Institute, Arco, BP Amoco, Chevron, Koch Industries, Shell Oil, Western States Petroleum, the Big Three auto companies, and carbon dioxide-spewing airlines. ExxonMobil provided $381,000 between 1998 and 2005. Green promoted the same fossil-fuel interests during his three years at the Fraser. The month after Canada ratified Kyoto, Green coordinated an issue of Fraser Forum, featuring six articles about climate change. Green’s contribution is an article titled “Kyoto Krazy.” He claimed, amazingly, that the science of global warming was still unsettled (in 2003!). There are two sides to the debate, he wrote. On one side are “environmental pressure groups” like the David Suzuki Foundation, which believes “the law is on their side, that they’ve been terribly conscientious about consultation and cooperation, that there really is a free lunch and Canadians can achieve draconian reductions in energy use at low cost.” On the other side, he says, are “more pragmatic researchers in the private sector and academia” who have shown that “Kyoto Protocol ratification will provide little benefit and will likely lead to real and wrenching economic impacts that will negatively affect the well being of Canadians.” Green, however, cites only one such pragmatic researcher in the private sector and academia, his Fraser Institute colleague, Ross McKitrick. Green continues his bizarre comparisons. On one side is a group “such as the United Nation’s [sic] Intergovernmental Panel on Climate Change, which has published reports suggesting that a warmer climate would cause major ecological disruption necessitating urgent action.” But other scientists, he goes on, “have shown that the threat of global warming is overstated by the United Nations.” Here too, Green cites only one source, McKitrick, who is an economist, not a scientist. In Green’s world, one economist with an agenda negates 2,000 climatologists who have fashioned a difficult consensus. Green also refers to the work of Sallie Baliunas and Willie Soon, who “explain” that global warming is a “natural and largely beneficent phenomenon,” due primarily to sunspot activity. His reference is Soon and Baliunas’s 2001 Fraser Institute pamphlet, which was based on their 1995 book, which had been discredited by then. Green left in 2005 to become executive director of the Washington, D.C.-based Environmental Literacy Council, which provides industry-friendly learning materials for American schoolchildren. This organization receives funding from many of the same sources as Reason: the American Petroleum Institute, ExxonMobil, the Sarah Scaife Foundation and the Charles G. Koch Foundation. Green also became a “visiting fellow” at the American Enterprise Institute, which had launched its National Research Initiative to “support, publish and disseminate” research by academics and other intellectuals on pressing public policy issues. Yet Green went beyond the activities of supporting, publishing and disseminating research while at the AEI. Just before the IPCC’s Fourth Summary Report was due to be released in February 2007, Green authored a letter on AEI letterhead offering $10,000 each to scientists and economists to write articles disputing the IPCC findings. Perhaps the AEI used some of the $960,000 it received from ExxonMobil, and perhaps ExxonMobil’s CEO, who was vice-chairman of the AEI’s board of trustees, played a role in this gambit. It’s not known how many scientists took the money. For many citizens, their understanding of global warming derives from what they read or watch in the media, not from an extensive knowledge of science. So whoever has access to the media will have more opportunity to persuade public opinion. Consider the case of a researcher with science council funding who works at a Canadian university and discovers a new piece of evidence that global warming is occurring. The evidence and the argument of the research are likely abstract and difficult for him to explain to a general-assignment reporter writing the story, so the research receives little, if any, coverage. Consider next the case of an economist who does little original research herself, but is funded in part by the fossil-fuel industry to spread the word that global warming is not occurring, and if it is, we don’t need to do anything about it, especially cut back on our use of fossil fuels. She is associated with a right-wing think-tank with a staff of media specialists and government lobbyists, whose primary function is to get pro-industry messages into the media. Add to that the predisposition of corporate-controlled media to filter out news or views critical of business. The result is a news system largely devoid of stories describing the links between business activity and environmental degradation. Very few stories were published in Canadian or American papers about ExxonMobil’s funding of the deniers. Add the further predisposition of reporters to present news in a balanced fashion, looking for two sides to a story. If the 2,000 climatologists of the IPCC release a study stating that the evidence for human causes of global warming just became stronger, a conscientious reporter will seek out a statement from a denier such as Tim Ball or Ross McKitrick, for the sake of balance. Only 19 of the “accredited experts in climate and related disciplines” were Canadian. Some were experts in paleoclimatology, which looks at climate changes over millions of years, so an increase of one or two degrees in the past 100 years would not be worthy of their consideration. Some still seemed to believe that sunspots could account for warming, even though that theory had been discredited. Signatories of the published letter included Patrick Michaels, Fred Singer, Tim Ball and Sallie Baliunas. They included non-climatologists like economist Ross McKitrick. Geographer Sonja Boehmer-Christiansen, editor of Energy & Environment, signed on too. The deniers’ letter was followed two weeks later by one from 90 supporters of Kyoto. This group called itself “climate-science leaders from the academic, public and private sectors across Canada.” Unlike the deniers, they were all Canadian and they were all climate scientists; no weasel phrases like “related scientific disciplines” were included. Their point was simple. The evidence was conclusive that warming has occurred and most of it was attributable to human activity. These conclusions, they wrote, were supported by the vast majority of the world’s climate scientists. Harper’s assignment was to get on with developing an “effective national strategy” to deal with climate change. The 60-expert letter was organized by a group called the Friends of Science, a Calgary-based coalition of oil-patch geologists, Conservatives, prominent climate-change deniers and public relations practitioners. The president is an oil and gas consultant. The vice-president worked as a geologist for major petroleum producers in Canada and the North Sea. The society was organized in 2002, as the Chrétien government was preparing to ratify Kyoto. Its first action was to bring prominent deniers to Ottawa in a last-ditch effort to sideline Kyoto ratification. That exercise was paid for by Imperial Oil and Talisman Energy and choreographed by the APCO public relations firm, as reported earlier in this chapter. With Harper’s victory, APCO and the Friends of Science believed they had a second chance to get rid of Kyoto and adopt the phantom made-in-Canada solution. But they had to ensure their oil-industry funding would remain hidden. Otherwise, they would not be credible with the public. How they did this was the subject of a 4,200-word story in the Globe and Mail in 2006 by Charles Montgomery. According to Montgomery, [Fraser Institute Calgary office director] Barry Cooper set up a fund at the university called the Science Education Fund. Donors could give to the fund through the Calgary Foundation, which administers much charitable giving in Calgary. Its policy is to guard the identities of donors. The Science Education Fund then provides money for the Friends of Science. Thanks to this clever scheme, oil-industry backing was rendered invisible. In 2004, the society pumped $400,000 into a 25-minute video entitled Climate Catastrophe Cancelled, which promoted the relatively minor uncertainties around global warming while ignoring the widely accepted certainties. Between 2004 and 2006, the Science Education Fund received an additional $200,000. In the run-up to the 2006 election, Friends aired 30-second radio spots that attacked Kyoto, targeting 200,000 Ontario residents in ridings where the Liberals were thought to be vulnerable. Were they effective? After the ads were aired, the Friends’ web site reported receiving 300,000 visitors and the Tories did win several of the seats. After Harper’s victory, Friends distributed thousands of copies of Climate Catastrophe Cancelled to politicians and news organizations across the country. In April they wrote the letter to Harper urging him to pull out of Kyoto. In May he did. Meanwhile, Charles Montgomery’s lengthy Globe and Mail feature about the Friends of Science was picked up by SourceWatch, a directory of propagandists created by public relations industry critics John Stauber and Sheldon Rampton. The spotlight beamed on Friends’ dubious funding arrangements led the University of Calgary to conduct an internal audit, which concluded that its trust account had been used to “support a partisan viewpoint on climate change.” The university shut down the account and contacted Elections Canada about an apparent violation of the Elections Act. Elections Canada ruled that the ads didn’t violate the law. They were not “election advertising” because they attacked the Kyoto Protocol and the science of climate change, and not specific candidates or parties. The spotlight also revealed that Morten Paulsen, Preston Manning’s former communications director, had received a one-year contract to promote Friends’ anti-Kyoto message. 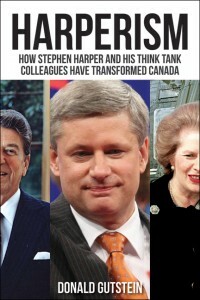 Paulsen was also working for oil giant ConocoPhillips at the time and had worked on the 2006 Conservative election campaign. The National Post did not report these developments, but had gone on an attack-dog rampage when Montgomery’s exposé first appeared in the Globe. Montgomery wrote his article, Post resident enforcer Terence Corcoran charged, because “Mr. Montgomery comes from the same ideological school” as Noam Chomsky. There, that’ll teach ya, don’t mess with us global-warming deniers. It was a rare insight into the intersection of interests by the oil industry, industry-funded front groups, radical-conservative academics, corporate media and Conservative Party apparatchiks.